The Retract-A-Lock unites a water bottle cage and a retractable cable lock into one convenient unit. No more fumbling for lock and cable with the all-new Retract-A-Lock. The Retract-A-Lock's rugged lock housing is made of lightweight aluminum and encases a retractable 60 inch long by 5mm diameter steel cable and brass key lock. The Retract-A-Lock mounts to any bicycle just like a watter bottle cage, with two one-way screws. 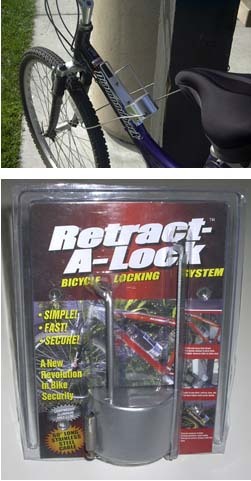 To lock a bicycle using the Retract-A-Lock, just pull out the cable, wrap around a pole, tree or bicycle stand then around the frame of the bike. Insert the cable end into the lock, turn the key and your'e done. It's that easy. For additional information go to www.astrotelusa.com then click on the photo of the Retract-A-Lock.